Lying and deception permeate human communication. How, when, and why do people lie? And how can we tell when they are lying to us? Lying and Deception in Human Interaction presents the subject from a variety of perspectives. The text primarily focuses on the communication process, while blending in concepts and examples from many important areas of study in the humanities and social sciences. · Examines the nature of truth and deception, as well as various ethical perspectives on when they are permissible or prohibited in communication. · Analyzes various manifestations of deceptive behavior. The text explains how human deception is a process that all living organisms on the planet display. It offers chapters on self-deception, children’s development of deception skills, and lying “experts” (imposters, spies, etc.). · Shares current examples of deception in popular culture and discusses the influence social media and the Internet have on lying. · Features a dedicated section on lie detection. It examines the accuracy of lie detection by humans and by machines (polygraphs, fMRI, etc.). · Illustrates how political leadership, journalism, writing history, memories, résumés, and the manipulation of visual images can deceive the masses. · Is practical! Knowledge of lying and deception provides students with cognitive and perceptual skills to better deal with con artists, Internet scams, and hoaxes. Mark L. Knapp (PhD, Pennsylvania State University) ​is the Jesse H. Jones Centennial Professor Emeritus in Communication and Distinguished Teaching Professor Emeritus at The University of Texas at Austin. He co-edited the Handbook of Interpersonal Communication and The Interplay of Truth and Deception. 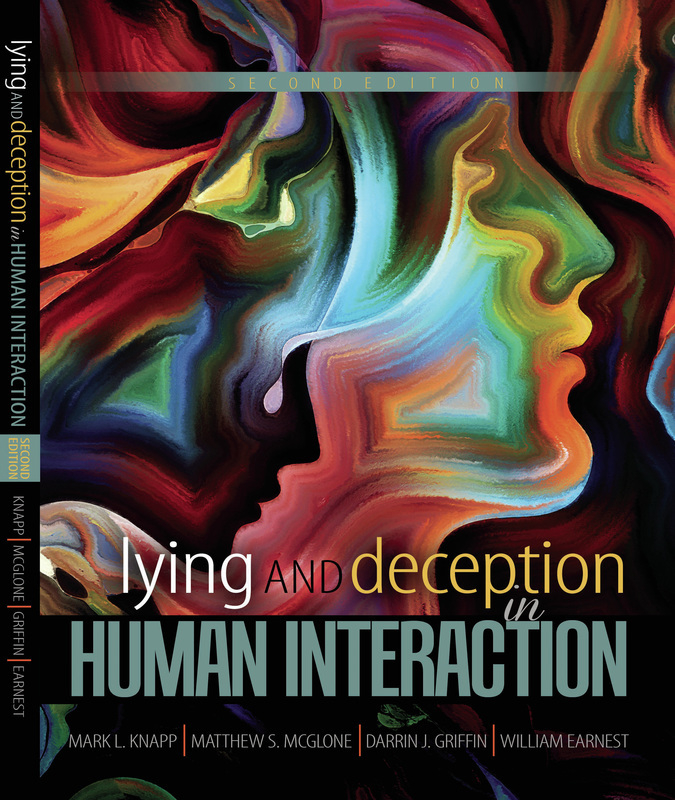 In addition to co-authoring Lying and Deception in Human Interaction, he co-authored Nonverbal Communication in Human Interaction and Interpersonal Communication in Human Relationships. He is the past president and fellow of the International Communication Association and past president and distinguished scholar of the National Communication Association. Matthew S. McGlone (PhD, Princeton University) is Professor of Communication Studies at The University of Texas at Austin. His research and teaching focus on deception, persuasion, and stereotyping in human interaction. He co-edited The Interplay of Truth and Deception and Work Pressures. He is Associate Director of UT’s Center for Health Communication and is a past chair of the National Communication Association’s Communication and Social Cognition Division. Darrin J. Griffin (PhD, University at Buffalo) is Assistant Professor and Director of the Human Communication Research Lab in the Department of Communication Studies at The University of Alabama. He teaches and researches interpersonal communication with a focus on topics involving deception. He has served as a research assistant at the Federal Bureau of Investigation Training Academy in Quantico, VA and the FBI’s field office in Buffalo, NY. He currently teaches an undergraduate and doctoral course on deception at Alabama. William J. Earnest (PhD, The University of Texas at Austin) Dr. William “Billy” Earnest is an Assistant Professor of Communication at St. Edward’s University in Austin, Texas. He has Ph.D. and Master’s degrees from The University of Texas at Austin, where he taught as an Assistant Instructor from 1997 until 2001. Not surprisingly, his doctoral work focused on the effectiveness of electronic slides as a communication medium. From 2002 to 2005 he was on the faculty of UT’s prestigious McCombs School of Business, where he lectured in Business Communication. While there, he was nominated for a Texas Exes Outstanding Teaching Award. Billy hails from Wichita Falls, Texas, home of his Alma Mater, Midwestern State University. From 1990 to 1995, he was an Atlanta-based systems analyst, technical writer, and corporate trainer for Electronic Data Systems. He and his 95-lb. ball of furry joy, Dylan D. Dawg, are proud to live in South Austin.